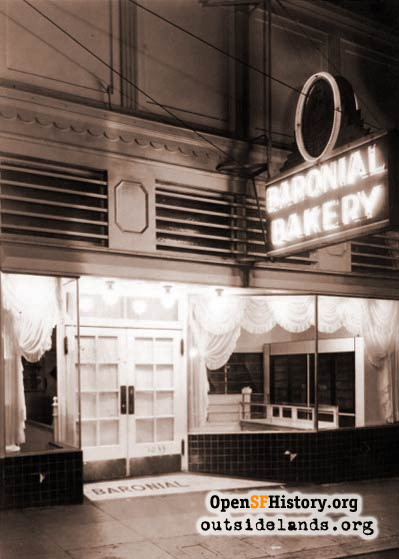 Remembering the tastes and aromas of a well-loved Taraval Street bakery. 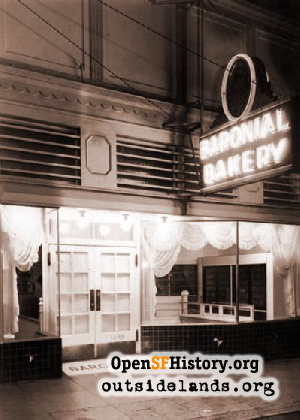 One of my favorite activities from childhood was walking past the Baronial Bakery on Taraval Street between 20th and 21st Avenue with one of my parents and inhaling all the great aromas coming out onto the street. In addition to Sunday morning doughnuts and Danish pastries, Baronial supplied virtually every birthday, confirmation, graduation, and “dinner for company” cake consumed by our family from the 1950s until the early 1970s—in fact, I still have and use the plastic cake cutter/server with the Baronial name on the handle that came with my Confirmation cake back in March of 1965. Then, like so many people, places, and things that we once took for granted, in the blink of an eye, Baronial was gone. Thanks to the miracle of the Internet, however, I recently made contact with the adult daughter of owners Willie and Wilma Nabbefeld. Cathy and her older brother Rick were unclear on some of the details—after all, their parents sold the bakery and retired well over forty years ago—all the way back in 1971—but with a little thinking and some online sleuthing, we now have a story as warm and fragrant as Baronial’s cinnamon-almond coffeecake on a foggy morning. 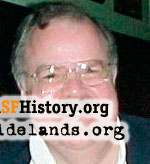 Willie Nabbefeld was born in San Francisco in the closing days of World War I, in 1918. His German-born father, John, was a baker who owned a shop on Mission Street near 22nd Street for many years—something I remembered my father frequently referring to as “Willie’s father’s bakery”— only two blocks from where Dad was born and spent his early childhood, and just a block from where Mom’s family lived from the 1930s until after World War II. Willie married Wilma in 1942, and they eventually lived with his widowed mother on 17th Avenue near Irving Street in the Sunset District. 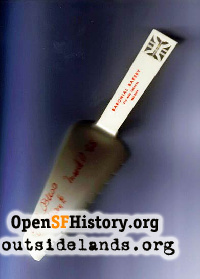 In 1946, Willie and his wife opened their own Taraval Bake Shop at 830 Taraval, between 18th and 19th Avenue, on the north side of the street, and my Dad became a regular customer when he was still living at home with his family at 21st and Rivera Street before he and Mom were married. I have only vague recollections of that tiny spot, but I do remember going there with my parents on Sunday mornings after Mass at the old 17th Avenue St. Cecilia Church (pre-1956) to pick up powdered sugar doughnuts. 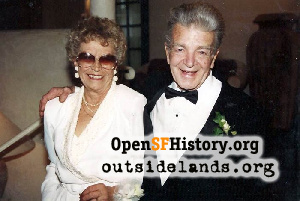 According to Willie and Wilma’s daughter, there was a serious fire in that first Taraval location, which prompted her parents to re-open elsewhere. 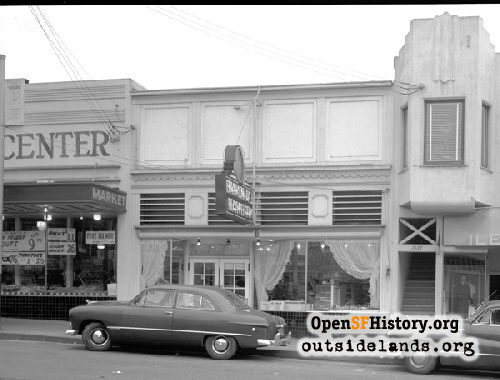 Baronial Bakery was nearby at 1033 Taraval, and the owners there (who also owned another “Baronial Bakery” on Irving Street as well as Priscilla Cake Box, the original Stonestown bakery), were living in Marin County, and ready for retirement. 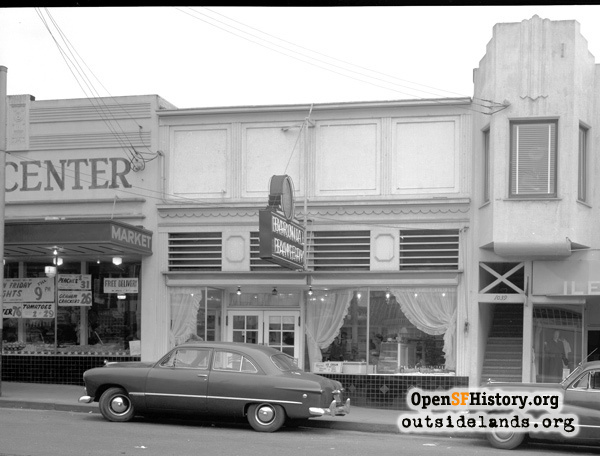 The Nabbefelds took over Baronial on Taraval about 1953-54, and quickly filled up the space. 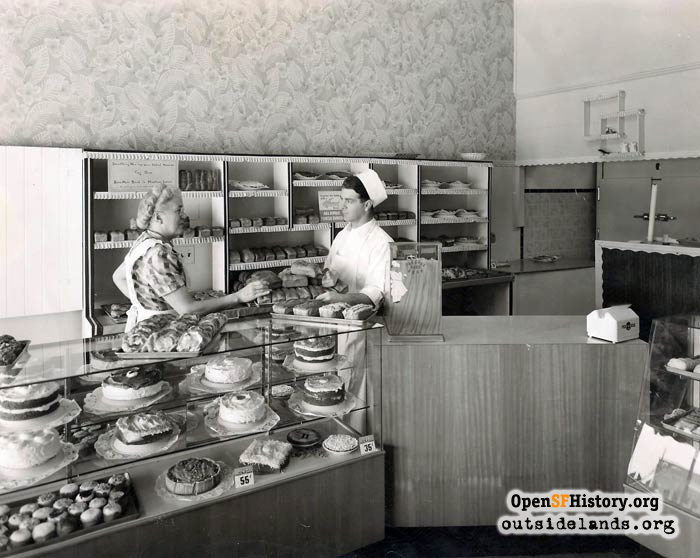 The glass cases were always sparkling clean, they kept fresh ruffled curtains in the windows, and their wide variety of baked goods—breads, cookies, cakes, pies, doughnuts, and Danish pastries—were all displayed to perfection. Willie and Wilma moved with their young son to a new home on 24th Avenue near Vicente Street, with Willie’s mother buying a similar house on the very same block. A few years later, daughter Cathy arrived to round out the family. By definition, baking is a tough business—in order to be open and ready for early-bird customers who started descending at 6:00 a.m., Willie had to be in the store and working sometime between 3:00 and 4:00 a.m. every day of the week. Walking from home on 24th Avenue up the hill to Taraval, rain or shine, he seldom encountered anyone else on the quiet streets. There were a handful of employees—a baker to assist with some of the kitchen work and a few older ladies to wait on the customers, but this was very much a family business. Willie’s mother occasionally helped out behind the counter, Wilma handled the books and the ordering of supplies, and both of the children worked there in their teens—Cathy folding thousands of pink cake boxes, and her brother Rick performing kitchen clean-up duties and setting up the proof box for the next day’s dough to rise. Cathy recalled that the only time the place would be closed was two weeks every August when the entire family took off for a Russian River vacation. Weekend mornings were particularly busy, and the Nabbefelds knew the Sunday Mass schedule at St. Cecilia’s by heart, even though they belonged to another church. Within five minutes after the end of each Mass (in those days, scheduled for 6:30, 8:00, 9:00, 10:00 11:00, and 12:15—with the last four services packing worshippers into both the upper and the lower church spaces), Baronial was inundated with customers. It was not just a Sunday morning stop for our family; it was also an essential part of Mom’s regular grocery shopping, especially in the days before she had a driver’s license. She would generally visit Baronial twice a week after purchasing groceries at the adjacent Rite Spot Market, and buy “half a cake” for dessert—this way, leftovers were consumed quickly, and a new flavor could be enjoyed later in the week. Without a doubt, Willie’s chocolate layer cake with mocha filling and glossy dark chocolate frosting was spectacular—and a traditional dessert on virtually every occasion that we had company for dinner. Whenever someone in the neighborhood had a death in the family, Mom would send a homemade casserole or “a nice box of Danish”—remember raisin snails, butter horns, and bear claws?—from Baronial. One memory that Cathy and her brother share is how their father used to wait until the children’s matinee at the Parkside Theatre was about to let out, and then he would stand on the sidewalk outside the bakery, with a huge squeeze bag of freshly whipped cream, and then dispense the perfect dollop directly into the mouth of each child who eagerly lined up—a long-gone bakery treat for neighborhood youngsters. After more than twenty-five years of a demanding seven-day-a-week schedule, the Nabbefelds were ready for retirement. 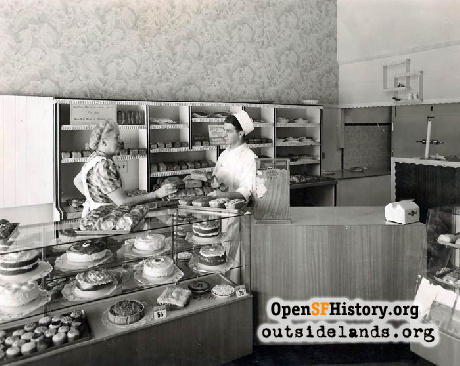 Stand-alone bakeries, while still popular, were beginning to feel strong competition from in-store baking operations by the big grocery store chains—and the large Safeway store on Taraval was then in the planning stages. In 1971, Willie and Wilma sold their beloved Baronial to another baker, who ran the place for just a few years before removing the equipment and closing up shop for good. Mom always complained that things were “just not the same” after Willie and Wilma retired. Sadly, the wonderful old recipes that Willie had learned from his parents and then perfected over his long career went with the store, and are now gone. 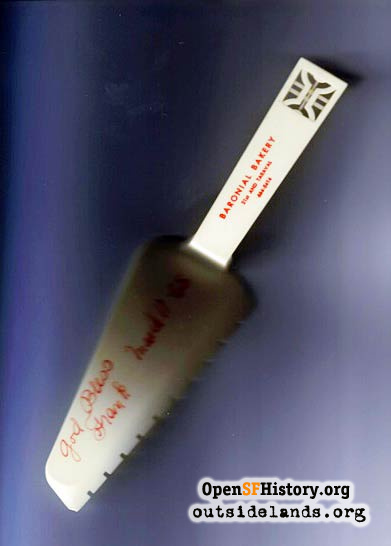 In any event, he always told his children that it was far too difficult to convert those huge measurements to the smaller amounts necessary for home baking, though he and Wilma were able to produce their son’s wedding cake in the 1970s in their home kitchen on 24th Avenue. 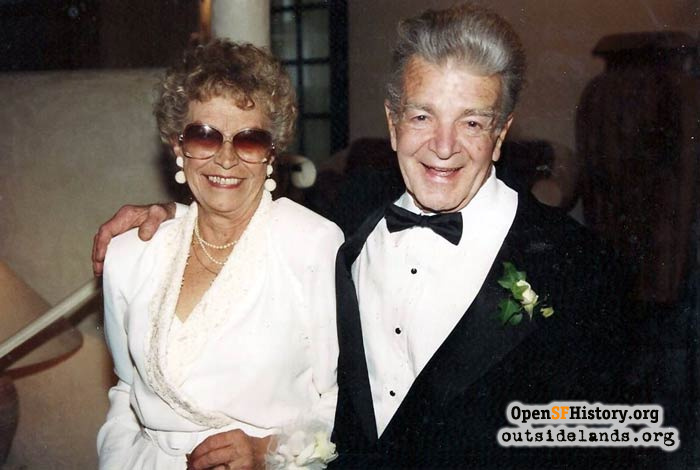 Willie and Wilma enjoyed a long retirement of more than twenty-five years, and engaged in their love of travel—something that was only possible for two weeks each summer during their working years—before passing away just eighteen months apart near the end of the millennium. Even today whenever I walk down Taraval, I can still smell those long-ago aromas of fresh baking as I pass by Baronial’s old location. I remember the excited kids lining up for a dollop of whipped cream, the friendly Sunday morning crowds spilling out onto the sidewalk, and recall the Nabbefelds—the wonderful people who made possible so many great memories that were shared with the relatives and friends who used to be seated around our family’s dining room table. Page launched 28 June 2014.